With all the rush of the holidays hitting full stride, I forgot to write about the Provo Haunted Half! Black Friday seemed to me to be a great time to write Part 2 of my Haunted Half race report (for part 1, click here). Not gonna lie, I was nervous about this race. 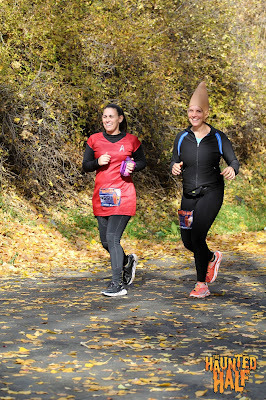 I was nervous that I was running the half marathon. 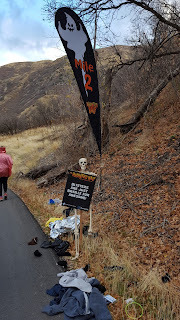 If my friend Tobi hadn't signed up specifically to run this race with me, I may have backed out and done the 5K like I did the week before with the Salt Lake City Haunted Half. Part of me secretly hoped that Tobi would want to switch to the shorter distance anyway. I was so nervous because of how sick I've been. Not only had I been battling a cold, but I also have been dealing with a flare up of my autoimmune disease which has made me all sorts of broken. I had a near-constant headache, I was incredibly tired to the point of exhaustion, I was nauseated, I have been struggling with insomnia, and I had lost a great deal of strength and endurance due to this disease. So, I was nervous. I worried that I wouldn't be able to finish the race in the time allocated. But if I never did anything while I was sick, then I would never do anything! I don't want to live my life just waiting for days when I feel well. I'm going to live life now, no matter how bad I feel. 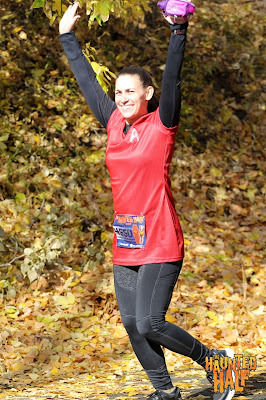 I decided I would take this race nice and easy and run according to how my body felt. If I had to walk a lot, so be it. 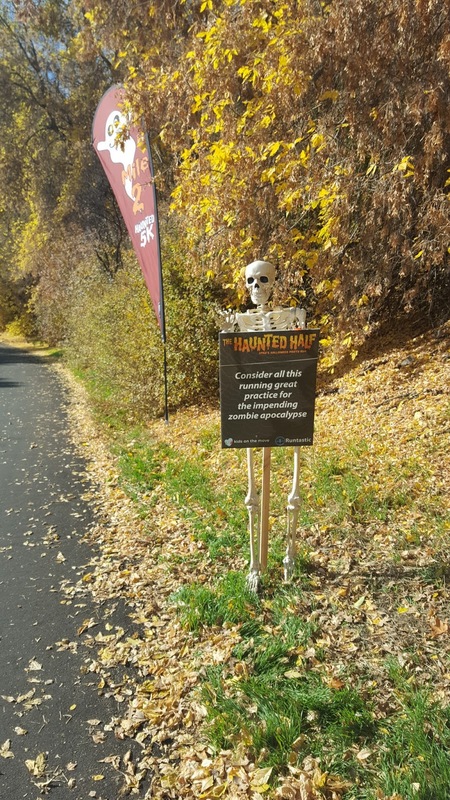 If I was running slowly, that's fine too. I knew I would finish, no matter what. So I showed up to the starting area because I knew Tobi would be there, and when we met up I felt so much better about the race. It's really incredible how much running buddies can lift one's spirits and motivation. 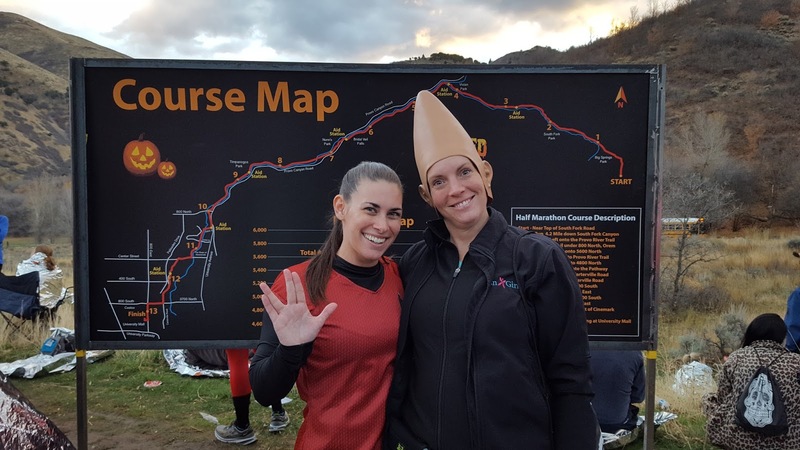 The excitement I initially had at running this fun, Halloween-themed race started to come back as we filed into the buses that would take us to the starting line and I saw all sorts of awesome costumes. 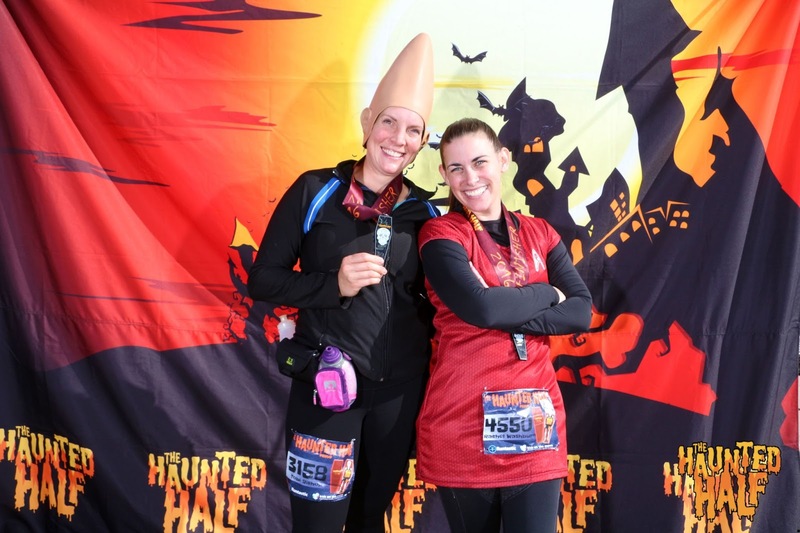 Tobi was dressed as a Conehead, which was amazing! 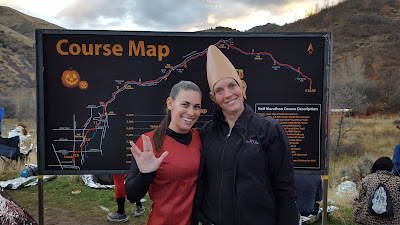 I was dressed in my Star Trek dress with my Skirt Sports Free Flow long sleeve shirt and Toasty Tights on underneath. 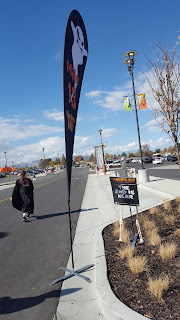 It was chilly and I wanted to not get hypothermia during a race again (see my experience with this on my Race Report for the Armed Forced Day half marathon). I loved running in these tights. They kept my legs and rear end warm, and the pockets were exactly what I needed to hold my phone, keys, and energy gels. 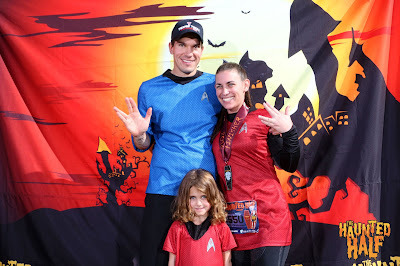 But really, the best part is that they matched my Star Trek costume without covering it up and kept me warm. Since it was so cold in the morning and the half marathon started up in the mountains of Provo Canyon, they had fire pits going and passed out emergency blankets, so we kept warm waiting for the start of the race. 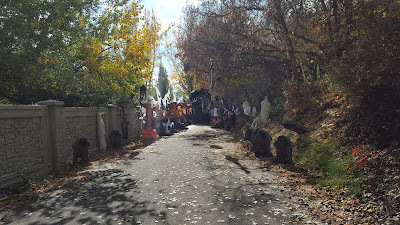 The DJ was great, and there was even a costume contest for all the runners which was fun to watch. Tobi is seriously awesome, and ran with me the whole way--even though she is far faster than I am! Up until mile 7, I was maintaining a decent 12 minutes per mile pace. 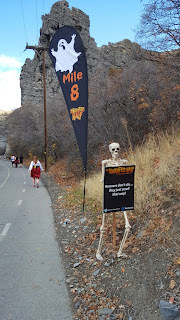 But then I started to falter and ended up having to walk just about the rest of the 6.1 miles of the race. And Tobi stayed by me the entire time. She made the time pass by pleasantly, and was so encouraging of me. She really is a true friend. My amazing husband and my sweet daughter were at all of the six spectator stops, cheering us on with signs also dressed in Star Trek outfits. It was one of the sweetest things anyone has ever done for me. 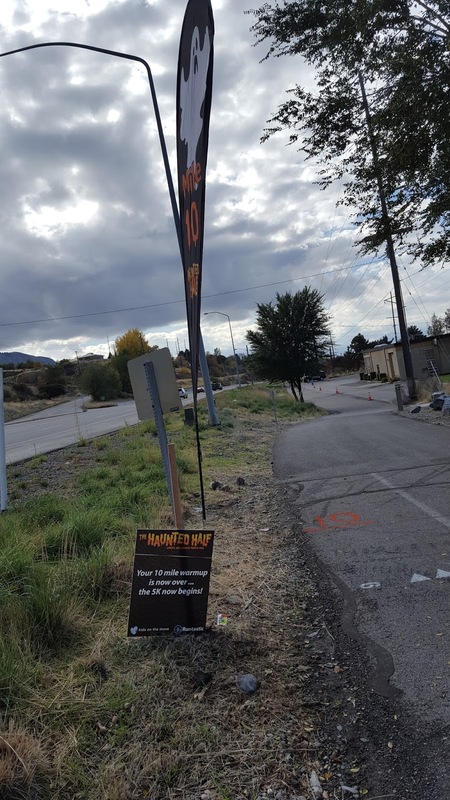 They even had new signs for each point. I love how much Alex supports me. He is truly incredible. 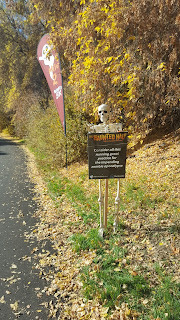 Even the runners around us soon came to expect them, and commented on how he should be named husband of the year. I agree with that completely. My family was at every single spectator point with new signs each time. My daughter wanted to run a mile with us, and we were glad to have her join. 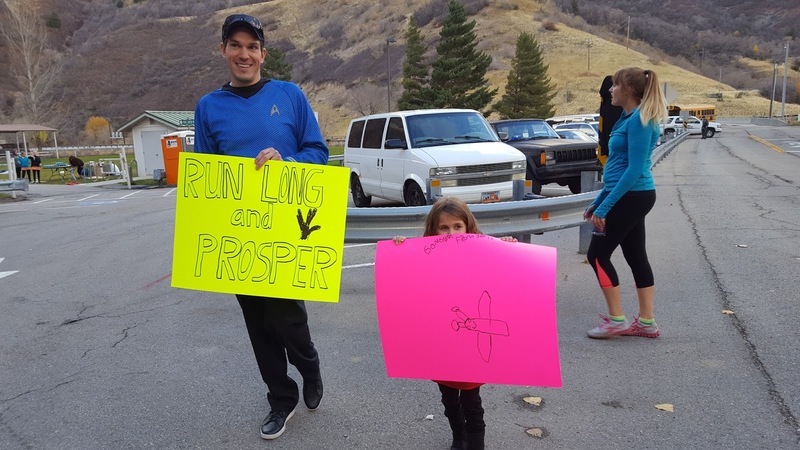 She ended up run/walking the nearly two miles to the next spectator point where Alex was waiting with another awesome sign. 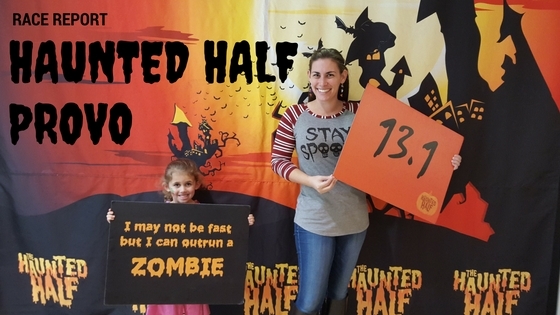 She did such a good job, and got a lot of race kudos from passing runners. From there, we were in the final stretch of the race. I was exhausted, but once I saw that finish line, I was able to run the last bit. I gave it my all without pushing myself to the point of injury or further illness. It was great to be able to even complete this race, even though it was my slowest-ever half marathon. Although I was disappointed in my time, I was also grateful that I could even do it at all. I'm thankful that my body can still do hard things, even when I'm fighting off a hard disease. However, I think this will be my last race of this distance until I overcome this autoimmune flare-up. 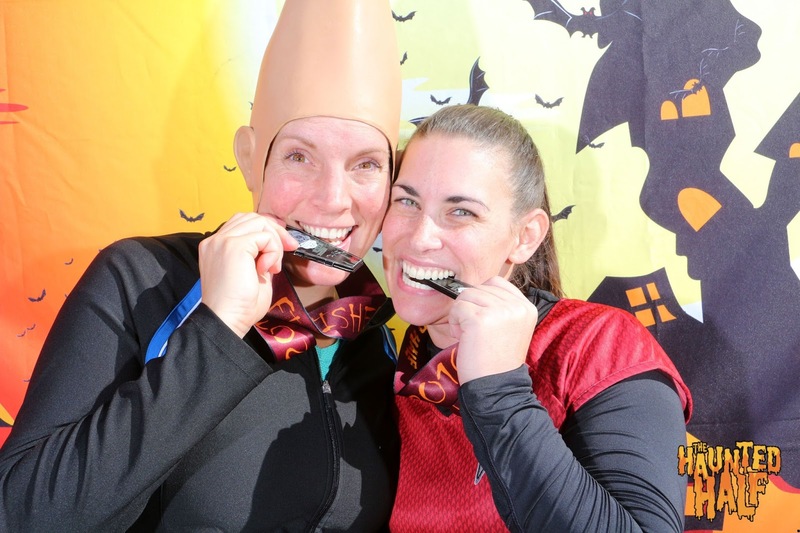 Runtastic events are such fun races! 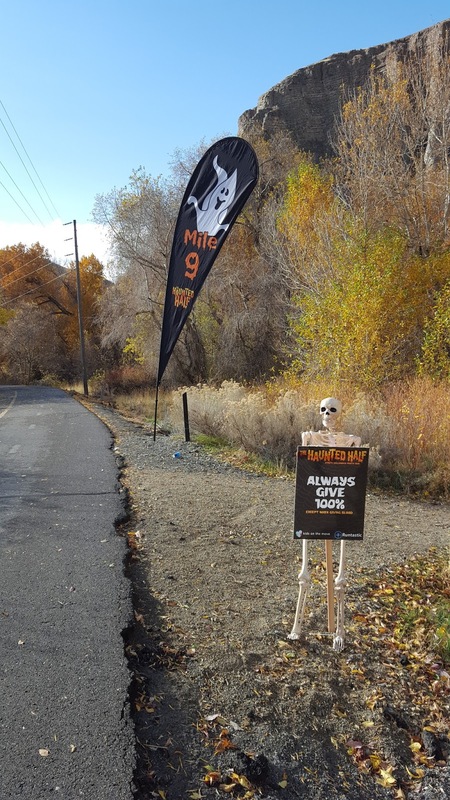 They are well organized, as I've said in previous race reports, and the swag is great! The medals were a coffin that actually opens and has a skeleton inside it! The shirts are super-soft long sleeve shirts with thumb holes (my favorite type of long sleeve!). They had all sorts of photo opportunities consisting of back drops and photo booths. And the final mile had a black light tunnel we got to run through, and a whole Halloween inflatable display we ran by. It was such a festive event! I hope to be able to do this one again. 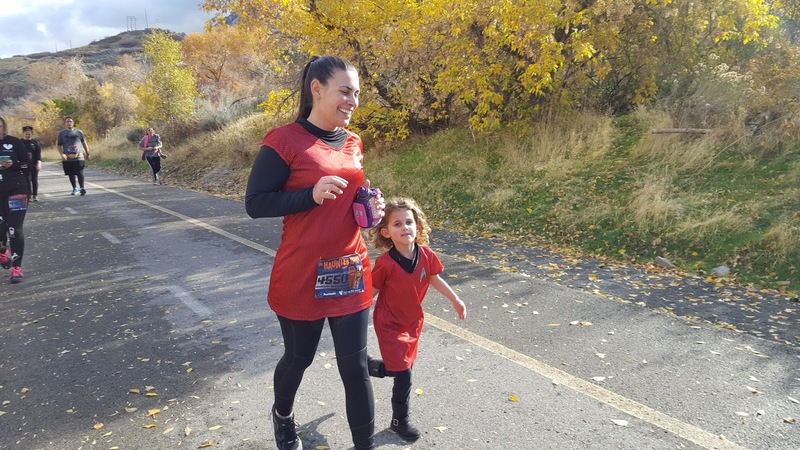 The best part of this race was the outpouring of love and support I received from my friend Tobi, my daughter, and my husband. It meant the world to me that they all were there to encourage me and help me to reach my goal of finishing. Finishers! No matter what obstacles we came across.